Sleep Cycle – This iPhone app sounds amazing! It actually monitors your movement and uses this data to determine an appropriate time to wake you so you are not in deep sleep. I’ve heard first hand accounts of its effectiveness, and is very highly rated. To learn more, and purchase this app, click here. Android users do not have this app available, but Sleep as Android is available. I downloaded the trial of this app and tested it out – it very effectively measures movement in the bed as an indicator of depth of sleep. Data collected showed what percentage of my sleep was ‘deep sleep’, the average amount of sleep debt I accumulated each night as well as total sleep debt during the course of the trial. Using this app I discovered that some reliable, consistent factors that were inhibiting sleep and used the data to make some changes. There is now an add-on for $1.79 that is called Sleep Stats and has more in-depth tracking as well as advice to gain more deep sleep. Well worth checking out if this is a concern for you. Out of Milk – I am using this all the time – I can keep track of what’s in my pantry, what I need to purchase, AND create additional lists – to do lists for business, restaurants to try out, movies to see, etc. The big sell on this is you can scan the barcode of an empty box to add it to your shopping list AND sync your list with your partner’s or email it to him or her so that you both don’t go to the store and double up, or you can make sure everything on the grocery list gets purchased! There is also an option to set reminder alarms for those items on the list, move things between lists, and see what you previously had on your grocery list so you have a running idea of frequent purchases, as well as their cost. Price: FREE, with $1.99 for an upgrade that allows online syncing and back-up, list sharing on multiple devices, and a coupon tracker. Out of Milk is free, then click here to upgrade to Out of Milk Pro for Android users. 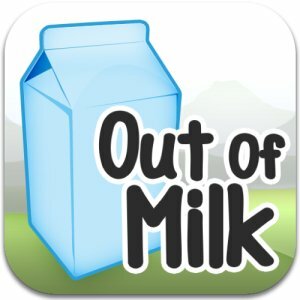 Apple users, fret not – Out of Milk is developing an iPhone app; in fact, they are looking for beta testers if you want to be one! Period Tracker – I have been using this app for over a year, and can subsequently geek out on knowing the exact day and length of my menstrual cycle. This tracker also allows you to log mood changes and PMS symptoms, weight, and body temperature and uses the last three cycles to fairly accurately determine your upcoming cycle date. This is PERFECT for what I call “PMS amnesia”, or that time of the month when you don’t know why you’re so cranky and irritable and sensitive…until you know EXACTLY why. 😉 It is also an excellent tool to monitor your fertility to prevent or facilitate pregnancy. Back in the day, when we just had calendars, my mom taught me to track my cycle by putting little flowers on the calendar when my cycle began. Seeing the flowers bloom on this app reminds me a little of that, and endears me to this app even more. My only request of Period Tracker: that it also track the lunar cycle so women can begin to see how the lunar cycle corresponds to their own menstrual cycle. Click here to download Period Tracker on the ‘droid for free and click here to download it from iTunes! There are tens of thousands of health apps on the market now – these are just a few I have come across that I believe offer great value and have proven useful to me personally. What are YOUR favorite health apps? I’d love to hear what else is out there, especially for iPhone users, since I have less exposure to those apps. Comment below and share which apps you find most useful! I absolutely LOVE the Sleep Cycle app for iPhone. I can track my sleep quality, effects on sleep quality (though right now I don’t use that feature well), time in bed averaged by week day or just for the past days, what time I went to bed, etc. I seriously love this. You do have to keep it plugged in and on all night, though. Streaks is one of my absolute favorite apps. The app is free, and the website is VERY cool – it’s basically gym for gamers – you literally level up. It was helpful when I had ZERO idea what I was doing at the gym. It would concretely give me suggestions for workouts and if I didn’t know the exercise, they had a demonstration. – also a free app. For period tracking, I prefer to use the website MyMonthlyCycles.com because if anything happens to your iphone – blah. I’ve been keeping track on that website for years. I love it. Thank you so much for your contribution, Julia!! Streaks sounds like one that is right up my alley; I’m going to see if they have a ‘Droid version of that.